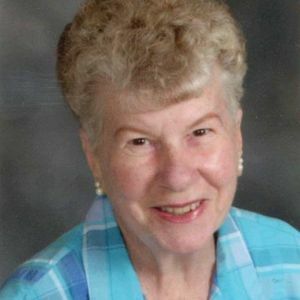 Greenwood – Evalyn (Lyn) J. Williams, 82, passed away April 9, 2019 in Greenwood, Indiana. Evalyn was born to the late William and Eva (Rankin) Crimmins on April 3, 1937 in Jersey City, New Jersey. Lyn was a loving mother, grandmother and great grandmother. She enjoyed spending time with her family. Survivors include, two children Michael Williams and Maureen Saltsgaver (Rex). Five grandchildren; Stephanie Rusher (Justin), Eric Williams (Shannon), Rachel Saltsgaver, Lindsey Saltsgaver (Brent) and Aaron Williams. Four great grandchildren, two brothers, William Crimmins and Steve Cavanaugh. A visitation will be held Monday, April 15, 2019 at Wilson St. Pierre Funeral Service & Crematory 481 W. Main St. Greenwood, IN, 46143 from 4-8 P.M. A Funeral Mass will be held Tuesday, April 16th at 10 A.M. at Our Lady of the Greenwood Catholic Church. Entombment will immediately follow at Forest Lawn Memory Gardens. In lieu of flowers, memorial contributions may be made to the American Cancer Society. Add your thoughts, prayers or a condolence to Evalyn's guestbook.